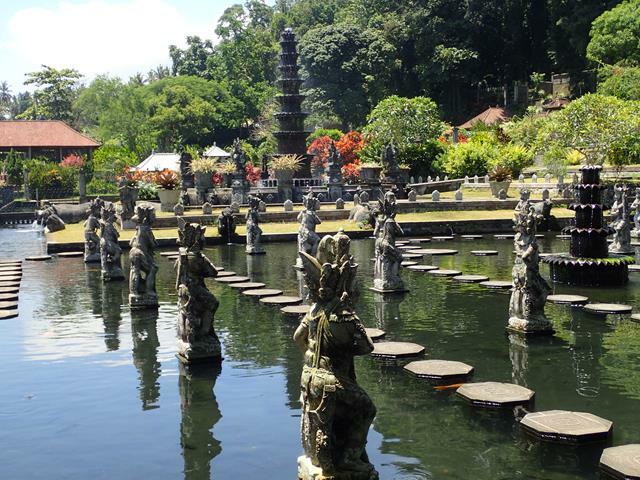 Tirta Gangga Water Palace is located on the north coast of Bali, half way between Candidasa and Amed. 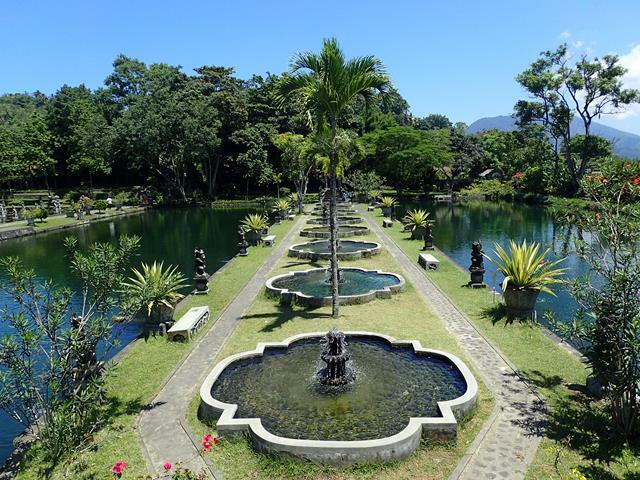 The Water Palace was on the Royal palace grounds of the former King of this region called the Raja of Karangasem. The water palace was built in 1948 and has a number of large pond areas with lots of various Hindu statues. The name Tirta Gangga means 'water from the Ganges' which is the large river in India which the Hindu worshipers use for cleansing their bodies. There are no longer any Royal kings in Bali though they have done an excellent job of preserving these beautiful Royal water gardens. Entrance fee into Tirta Gangga is 20,000Rp, no discount for children, 1 price for everyone. The is a large pond area at the back of the grounds which is open for public swimming. You will see many local Indonesian tourists swimming here. It probably takes around 20 minutes to walk around the grounds of Tirta Gangga so if you want to combine this with a day trip with some other areas close by. A suggested day trip could include a visit to the Mother Temple which is north of Tirta Gangga at the base of Gunung Agung. Get to the mother temple first thing in the morning, then drive back to Tirta Gangga for a visit to the water temple and there are some restaurants found here to stop and have lunch. On the way back in the afternoon stop at the Bali Elephant Safari Park. Or you could do a day trip to Amed for some snorkeling and either stop at Tirta Gangga on the way up or on the way back. It takes around 2.5 hours to drive to Tirta Ganng from Kuta. It is round 2 hours drive from Sanur. If you are staying in Amed it takes around 30 minutes to drive down to Tirta Gangga.